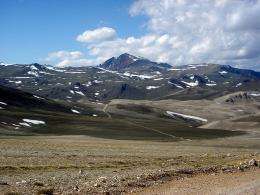 (PhysOrg.com) -- A new study has found the secret to effortless weight loss: spend some time at high altitude. Even a week on a mountain retreat can produce weight loss in sedentary people eating as much as they want and doing no exercise at all. A study in 1957 showed that animals lose weight at high altitudes, and weight loss has long been known for people at high altitudes, but the subjects were all extremely fit and active mountaineers and skiers. Obese and overweight people tend to suffer altitude sickness and resultant nausea, dizziness and heart attacks, when at very high altitudes, so the research team from the Ludwig-Maximilians University in Munich decided to find out what would happen if overweight people spent some time at a moderately high altitude of 8,700 feet. Their 20 subjects, all male, were of average age 56, obese (average BMI of 34), and with risk factors for diabetes, strokes and heart disease. They were all from Munich, which is around 1,740 feet above sea level, and were housed for a week in a research station 1,000 feet below the peak of Zugspitze, Germany’s highest mountain. They were encouraged to eat and drink as much as they wished, and apart from leisurely walks around the station, were not allowed to do any exercise. The research team monitored their subjects’ weight, calorie intake, metabolic rate, and hormone levels before their stay, during the week, and a month afterwards. Leader of the team, Dr Florian J. Lippl, said that during the week the subjects ate around an average of 730 calories less than they had before their stay, and they lost 3.5 lb on average. During the month after their stay they regained an average of 1.5 lb, but they were still burning slightly more calories than they had before their alpine stay. Dr Lippl said the levels of the hormone leptin, which suppresses appetite, rose during their week at high altitude, while the hunger hormone grehlin was unchanged, and this meant they were less hungry during their stay. Their metabolic rate was also higher at altitude, which meant they burned more calories and this, combined with the lower calorie intake, caused the weight loss. The research is in a preliminary stage; no data was collected on whether the weight loss was fat tissue, water, or muscle weight, and there was no control group. The researchers plan to use a higher mountain in Italy for the next stage of the research. One drawback to the mountain retreat for weight loss idea is the finding that after only a month the subjects had re-gained one third of their lost weight. Other studies have shown that appetites return to normal if people are living at high altitude for around six months. Another drawback is the potential for adverse health effects for overweight people at high altitudes, since they can be more prone to heart attacks and other conditions. Professor Richard N. Bergman of the University of Southern California said the study was preliminary but interesting, and noted that in the U.S. the state of Colorado, which has the highest mean elevation, also has the lowest rate of obesity rate, while the highest rates of obesity tend to occur in states with low mean elevations. The research paper was published in the journal Obesity on 4th February. I wonder what is the minimum altitude is for this effect to take place? Well, that explains why the Swiss can afford eating so much chocolate. Most people in Switzerland live in the valleys - not on the mountains. Zurich, for example, is 1500ft above sea level (of the top ten cities 9 are below 1700ft). People raised at higher altitudes have slightly larger lung capacity. Perhaps the higher metabolic rate is simply due to people with smaller lung volume needing to breathe at a faster rate once moving to higher altitude, a process which might change once their red blood cell count increases to adapt to the lower oxygen levels. This makes one wonder if the benefit is reduced for people raised at high altitude. Do people who move to Colorado weigh less than Colorado natives? We have to use this information to set up weight loss camps before the other guys find out and set up a camp of their own. Gotta grab the market share at the early stages. We could do one high profile one with enhanced facilities , and we could also have some simpler ones for lower income clients. Should have read "If you want to lose weight, get high."